Stars Over Washington: The Presidencies of Washington and Trump = Uranus! The Presidencies of Washington and Trump = Uranus! Quite a while ago I posted on another blog the horoscope of America's very first Inauguration of George Washington, an event held on April 30, 1789 at 12:45 pm LMT on Wall Street, New York City. 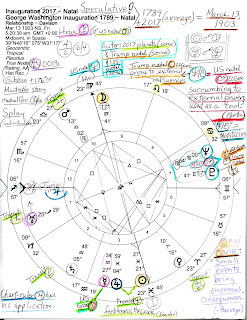 Around Stars Over Washington you'll find more than one copy of the horoscope of Inauguration 2017, a post displaying a synastry grid between the Inauguration 2017 Horoscope and Mr. Trump's natal planets as well as his natal chart. Patriot George Washington Not the Only Quirky Rebel Around Here! Now since the quirky rebel Uranian Mr. Trump, the gold-loving brander-in-chief, tends to make light of the US presidency in the view of many people (he dabbles), why not engage in a quirky consideration of the 1789 Inauguration horoscope blended with the chart of Inauguration 2017--just to see what the resulting Composite/Davison relationship chart tells us about George and Donald and the American people? Perhaps an interesting topic will arise! And so it does, as you see in the chart, below. But if you, dear reader, are sensitive to such lighthearted shenanigans (such as utilizing Astrology as a tool for speculation--and on Independence Day no less! ), you are hereby cautioned to stop reading here. Seriously. Stop. For the rest of us celebrators, below is a view of the 1789 + 2017 Composite/Davison horoscope with way too many factors penned on (as usual) so please enlarge the image if you wish to read my notes. 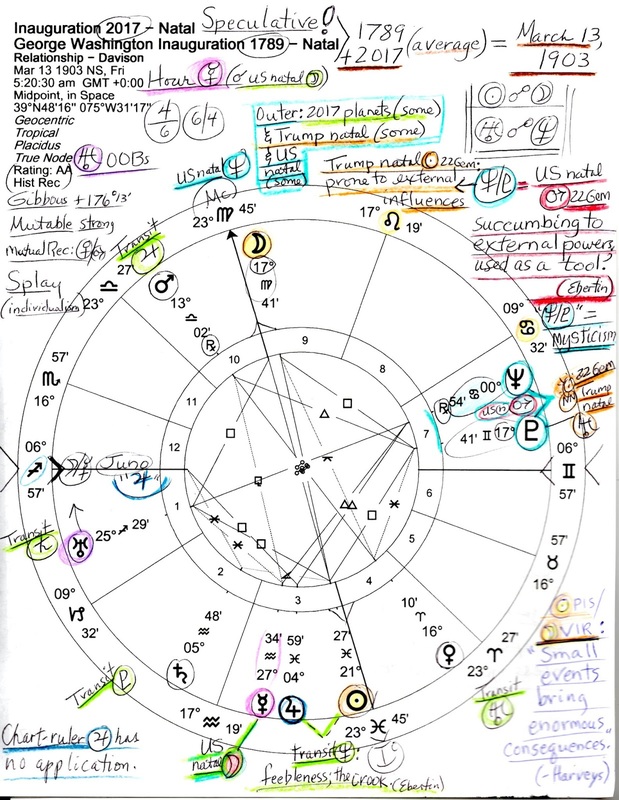 Penned around the chart are some US natal planets (green), some of Trump's natal planets (yellow orange), and a few current 2017 transits (also in green). Chart-ruler Jupiter is robed in blue (no application), rising Uranus, planet of Technology, radical reforms, upheaval, and shock, is lavender. As for the Mysticism pair, Neptune and Pluto, please note that George Washington and many other presidents were Freemasons and therefore of a mystical bent. My suspicion is that Mr. Trump is a Mason and/or Illuminati adherent as well, especially considering all those hand symbols he constantly throws out during speeches--such as his odd Inaugural Address promoting a dark dystopian view of America. (See George W. sporting his Masonic apron and symbols, sidebar->). So one factor always interesting when two charts are blended (averaged) is the resulting mid-point date - here between April 30, 1789 + January 20, 2017 the date is May 13, 1903 so right away we both think of our 26th President Theodore Roosevelt (October 27, 1858--January 6, 1919), in office from September 14, 1901 to March 4, 1909. In May 1903, On This Day lists him engaged in his anti-trust-busting campaign but can his campaign relate to our speculative topic here? Apparently so since nowadays multiple corporations are busy forming monopolies, regardless of the affect on our nation's economy and people. Any US presidency is a mere part of a process or a cycle, after all, and in 2017 We The People have reached where we are, here and now, with all that has gone before part of our national DNA. Not that 'government by consent of the governed' is followed anymore by current oligarchs but we retain the right to redress of our grievances, don't we? Okay, so techie futurist Uranus, quirky planet of new thoughts and methods, radical politics, startling reforms, shocks and chaos rises in the Comp/Dav chart of May 13, 1903 bringing the need for anti-trust-busting with it. What else? Well, any of Teddy R's Progressive Movement policies may be spotlighted here (and require protection in 2017) along with his vast Jupiterian personality and style of leadership fairly similar in some respects to Mr. Trump's. Now remember that our study is only speculative yet another chart factor we may wish to consider is the Pisces Sun (POTUS; leadership) opposing the Virgo Moon (We The People) and what this implied in 1903, yes, but what it may also imply for societal conditions in 2017. How do you read the Sun-Moon opposition? I read it as vague, secretive, mysterious leaders (Sun in Pisces) promoting, allowing, and/or using misconceptions, misunderstandings, distraction, confusion, and deceit to affect current conditions and to hide sneaky legislation that most of us will loathe when we find out about it. The people (Moon) are critical and nervous (Virgo) because leadership (Sun) hides (Pisces) its true motives while propagandizing, weaponizing, privatizing and monetizing everything they can get their greedy little claws on. Scandals, leaks, cover-ups, step-downs, pay-offs, and favors abound while leaders make impossible demands without caring how the consequences will affect We The People (ex: Trumpcare passage). The negative conditions and chaos thus created can be overcome but it won't be easy. For you know that a regressive Donald Trump Hearts President Andrew Jackson whose natal Sun-Moon blend is the very Pisces-Virgo polarity revealed in the 1913 horoscope! How crazy is that? Solar goals hidden beneath Piscean shade, in Politics a corrupt picture that is astrologically supported in 2017 by the fact that transit Neptune (today @14Pisces), planet of fraud, loss, disappointment, and dissolution now surrounds in mystery and obfuscation US progressed Sun (POTUS) indicating a period when a public image can be deceitful, secretive, crime-ridden, scandal-prone, and/or eroded. Actually, we've discussed this Neptune transit to US SP Sun in a previous post if you care to take a look. So! What else has our speculative chart investigation with Uranus rising revealed? Transit Saturn in Sagittarius is on course to visit this Uranus (25Sag29) denoting a period of limitation of freedom and resistance to unorthodox ideas which may be rejected as structure and tradition are called for. Initial delays are frustrating but better planning and organization may eventually carry the day--such as with Trump's 'travel ban' against Muslims being reworked and its provisions partially allowed by a SCOTUS decision recently. Follow this link in case the video is removed (it will be worth your time). The POTUS 'unbirthday' of July 23, 2017 when the Sun opposes the Inaugural POTUS Sun (00Leo/00AQ) spotlighting presidential frustrations, and a reassessment of the year's goals which should occur and a new course set if needed. The Whimsical Sun (POTUS) of Inauguration 2017. Whimsical? Now that's one thing they never called reliable George Washington in his day. Any bets? From July 4, 2012: The Natal Horoscope and Character of George Washington. Washington DC's Secret Symbolism: From Past to Future. Friday May 13, 2016: The History of Freemasonry and The Skull and Bones (video).